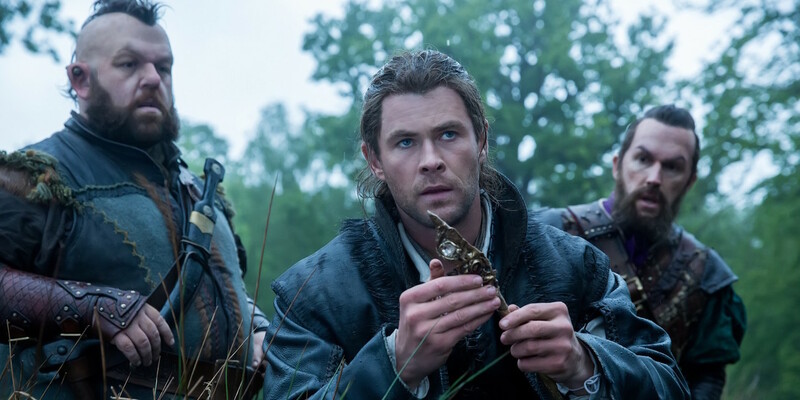 EVERY SINGLE PIECE OF THE HUNTSMAN: WINTER’S WAR UNDERWHELMS – RESULTING IN A STRAINED PREQUEL/SEQUEL/SPIN-OFF FAIRYTALE WITH VERY LITTLE MAGIC. Long before Snow White rose to defeat the malevolent sorceress Ravenna (Charlize Theron), the Evil Queen moved unchecked from kingdom to kingdom, murdering rulers, amassing power and fortune, with her tender-hearted sister, Freya (Emily Blunt), in tow. Yet, when Freya’s lover kills their newborn child, she discovers her own dormant magic ability – control of frost and ice. Armed with new powers, and scarred from her lover’s treachery, the cryomancer heads North, carving out her own dominion – a place where love is a sin – and taking in the orphaned children of kingdoms she conquers, training the youth to fight as warriors in her personal army of “huntsmen”. 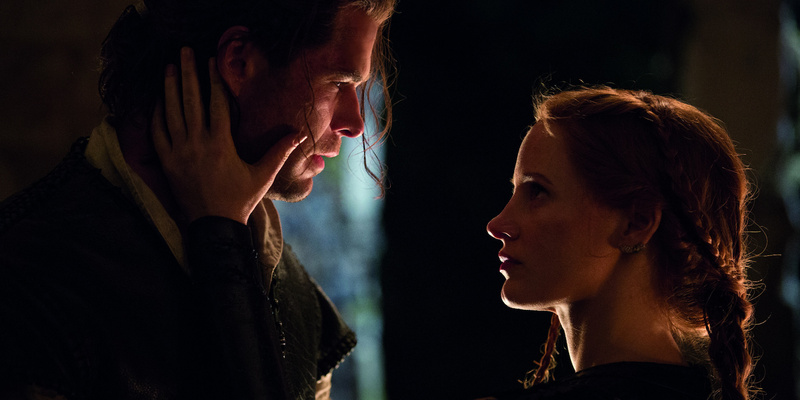 When two of her best huntsmen, Eric (Chris Hemsworth) and Sara (Jessica Chastain), fall in love, Freya is forced to make an example out of the pair – unintentionally setting a heartbroken Eric onto a path that would eventually lead to Ravenna’s downfall at the hands of Snow White years later. Unfortunately, Snow White’s victory is short-lived, as a dangerous black magic haunts the benevolent ruler – and the new queen is forced to call on Eric for help once again, sending the Huntsman back into battle to face an old enemy – and the promise of closure to his past life. Where moviegoers and critics were split on Rupert Sanders’ Snow White and the Huntsman (for a variety of reasons), the film managed to rack up a solid box office turn – cementing interest in a sequel, The Huntsman: Winter’s War, at Universal Pictures. Unfortunately, behind-the-scenes controversy derailed production on a full-on sequel to the film – causing both the director and star Kristen Stewart to leave The Huntsman followup. In the coming months, the studio courted several well-respected filmmakers (including Frank Darabont) – eventually settling on Snow White and the Huntsman‘s second-unit director, Cedric Nicolas-Troyan, to helm the project (marking his feature debut). The result is exactly what moviegoers likely expected: fleeting moments of fun that are undermined by clumsy filmmaking, cheesy performances, mundane effects, and bizarre retcons of Snow White and the Huntsman events in order to salvage a franchise – rather than deliver a quality film set in theHuntsman‘s world. In spite of lengthy exposition (from Liam Neeson) that attempts to reframe the Snow White story around The Huntsman, Winter’s War fails to build on, nor differentiate itself from, the prior franchise entry. Instead of a clean relaunch or continuation,Winter’s War spends a significant amount of time justifying why The Huntsman isn’t with Snow White (in spite of a life-giving “true love” kiss in the previous film) – endeavoring to both keep the door open for Stewart to return while also charting a course without her (in which the Huntsman and his own band of accomplices could return for a third entry). In juggling the future of this story, as a film series, Nicolas-Troyan is diverted through a wishy-washy set of hurdles that refuse to commit any main character to a definitive fate or personality – subsequently undermining any emotional impact the onscreen drama should deliver. A bizarre patchwork of uninspired choices turn Winter’s War into an unappealing franchiseproduct rather than coherent standalone film experience, as Nicolas-Troyan’s installment falls short in providing the same visual flair, exciting action-fantasy spectacle, or stirring tale of self-empowerment that made Sanders’ adaptation a surprise hit at the box office. Among some of the clumsier aspects, as the director attempted to tether Winter’s War to its predecessor, is that Snow White is only shown from the back (making it more, not less, apparent that Stewart did not return), only one of the original seven dwarves, Nion (portrayed by Nick Frost) returns to assist Eric, and the filmmakers retcon the death of Ravenna for an underwhelming third-act twist (spoiled in the film’s marketing), with absolutely no evidence in Snow White to support it. The worst part? Undoing or attempting to ignore the enormous shifts from Snow White to Winter’s War ultimately undercuts the success of storytelling and characters thatactually worked in the first chapter. A convoluted backstory makes The Huntsman less interesting and less nuanced, an abrupt return from Ravenna twists the malevolent baddie into an immortal fairy tale villain (ignoring the character’s previous origin and motivation: as a victim of abuse who eventually uses her power to control rather than be controlled), all while Snow White is casually name-dropped by other characters more times than she actually appears on screen (even once by a blink and you’ll miss it cameo from rival Snow White and the Huntsman love-interest William, played by Sam Claflin). 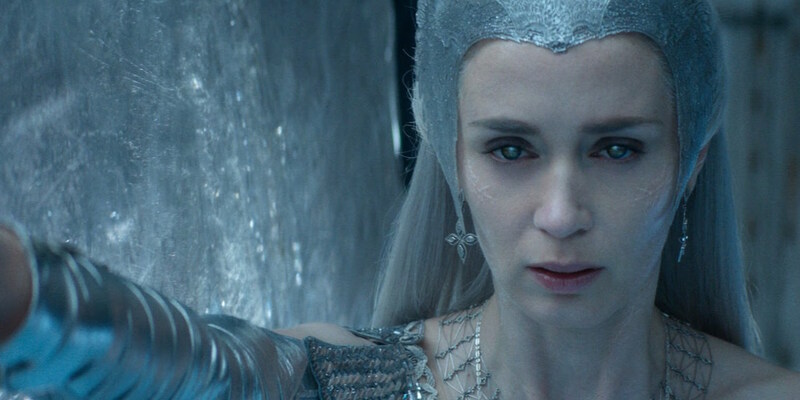 Subverting prior characters would be forgivable if Winter’s War introduced audiences to an even better band of new players; sadly, every single freshman Winter’s War character is a shell of a better hero or villain from the first movie – especially the sequel’s Ice Queen. After numerous fan-favorite turns (in everything from Looper to Edge of Tomorrow to Sicario), Emily Blunt’s talent is completely wasted on Freya. Where the character works at the most basic level, as a metaphor for isolation and depression in the aftermath of personal tragedy, and a point of juxtaposition for the core message of “love conquering all,” that doesn’t make Freya an interesting, affecting, or entertaining villain to follow in this story. Instead, Freya spends the majority of Winter’s War in an emotionless haze, isolated mentally and physically (rarely leaving the safety of her fortress) from the main story and its heroes – ultimately offering muted payoff when her personal ideology, and subsequent emotional wall, begin to crack. Jessica Chastain is given slightly more as Sara, including a pair of slick fight scenes, but the character (and the performance) are slave to a melodramatic arc and half-baked twists – that, despite efforts to make Sara a strong female lead, ultimately confine the character in a no-nonsense warrior-princess outline (since Snow White isn’t along for the ride this time). Sara is positioned to reflect both the power (Eric) and pain (Freyda) of love but the movie repositions the character so frequently that Sara’s motivations and “true” feelings are hard to track (at best) and are more plot point than quality character development (at worst). Even when Snow White and the Huntsman fell flat, the film was buoyed by Sanders’ stylized fantasy riffs (as well as visual effects work), which made even mundane action lookexciting in the moment, and a comparatively dark otherverse retelling of Snow White that twisted the damsel-in-distress fairytale protagonist into a battle-worn heroine capable of inspiring others (by full-on fighting for her kingdom). As a result, Sanders established an intriguing fantasy world in which Universal Pictures could tell future stories – but, in attempting to build directly on the success of Snow White, while refocusing on the titular Huntsman, the studio squandered any remaining potential. Ultimately, every single piece of The Huntsman: Winter’s War underwhelms – resulting in a strained prequel/sequel/spin-off fairytale with very little magic.